Do you think I would even think of ending this podcast with out giving you all one last huge ska/punk episode? If ska/punk isn’t yr thing, I understand, I get it, but I love it just as much as I dig the more traditional sound. Ok, yeah, I’m still trying to figure out what the countdown means, I decided not to kill 23min of Ska a few weeks ago, but this has still got to lead someplace, and I don’t know what to do after this. There’s always been some kind of method to my madness, as random as it seems, that keeps be going, past the joy that listening to ska music brings me. I just need to find that next hook, that warp zone to the next level, and I’ll be set. I’m sure I’ll get there, I’m sure we all will. Life isn’t worth living if you not striving for next. 23min of Ska : Hey, High Fives All Around! Five! The countdown is real… in case you haven’t noticed for the last eighteen episodes the titles have been counting down… but to what? Truth be told, it might be counting down to the end. The end of the podcast proper? When I started the countdown, yes, this is exactly what it was leading to. But I’m having second thoughts. Months ago when this countdown started it was when I was getting hardly any downloads, listens, shares, likes, what-have-you and zero feedback. It was depressing. Ska isn’t supposed to depress people. Then the month of January hit… and it has been crazy! Huge download numbers, a number of new listeners and several supportive comments… I’m kind of shocked. It makes me want to keep going. So what are we counting down to? Listeners, tell me what you want from this podcast, we’ll go from there! This show is nothing with out you and the bands, I’m just a middle man, hit me up, let me know! 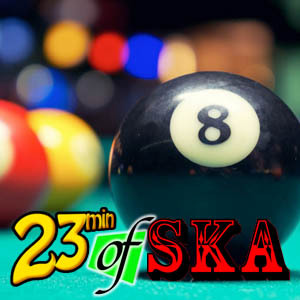 Maybe we’re just counting down to an even better version of 23min of Ska!